The 2012 UGA Picture day will be held on Saturday, August 18 and will feature Mark Richt, interim mascot Russ, football players and other athletic teams. Fans will need special ticket coupons to access the location for Mark Richt and Russ. 150 tickets for each will be distributed beginning at 8 a.m. from the East Campus ticket windows. The fans with tickets will access through Gate 4 and be directed to the entry for the Sky Suites North tower. Russ will be available for pictures from 1-3 p.m. Fans with tickets must be in line by 1:30. Mark Richt will be available from 3-5 p.m. and you must be in line by 3:30 p.m.
Gates 2 and 4 will open at 1 p.m. for fans to get in line for autographs. Other sports teams will sign from 1-3 p.m. Football will sign from 3-5 p.m in Reed Plaza on the north side of the stadium between Gates 2 and 4. Georgia cheerleaders and Hairy Dawg will be available from 1-5 p.m. Concessions will be available in several areas of Reed Plaza. 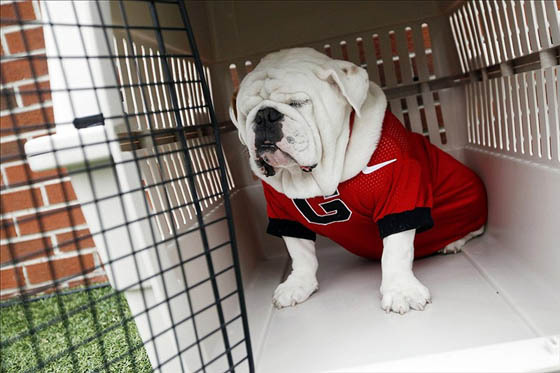 The UGA Bookstore will be open from 10 a.m. to 6 p.m.